I’d like to believe I’m a good man who came to help, but if that’s the case, I’m making a damn mess of things. 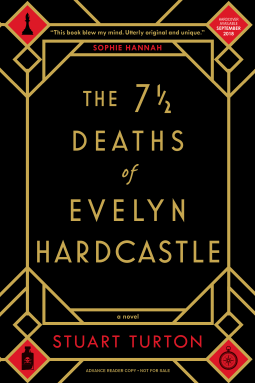 Every night, Evelyn Hardcastle will be murdered at 11:00 p.m. Every night. That is unless Aidan Bishop can solve the mystery of her murder and give her killer’s name to the one pulling all the strings – the Plague Doctor, therefore ending the loop. I have to admit that this book didn’t grab me at first – there were so many characters, so many events to keep track of, and a lot of incongruous action that happens in and out of time. It was not easy to follow. However, as the truth of Aidan’s involvement becomes apparent, the intricacies of this clever mystery become fully appreciable. I suddenly have the sense of taking part in a play in which everybody knows their lines but me. Stuart Turton has written a suspenseful novel with charismatic characters that will at once charm you deeper into the story and baffle your tenuous understanding of it even more. I recommend this book to lovers of Sherlock Holmes and Hercule Poirot, as well as fans of suspenseful mysteries and whodunits. It’s Groundhog Day with a murder mystery twist. I can see the breadcrumbs laid out ahead of me, but for all I know, they’re leading me toward a cliff edge. Many thanks to NetGalley, Sourcebooks Landmark, and the author for the opportunity to read and review this book.